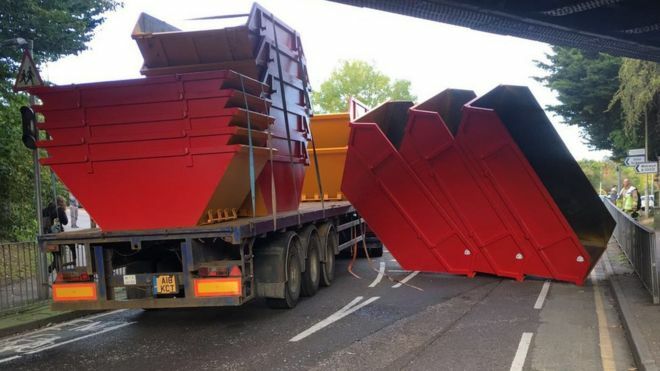 By the start of 2017, one bridge in Leicestershire was hit by lorry trucks 11 times in 12 months, according to Network Rail. This is far from an isolated incident, as the group documented 1,606 underline bridge strikes and 136 overline bridge strikes by the end of 2015/16 financial year. Given these numbers, the Local Government Association called for a ban on lorry drivers from using car Sat Navs, and instead use GPS systems suitable for HGVs. While it is now a challenge to imagine, a few decades ago, Sat Nav units were of science fiction territory. In-car navigation systems were not considered a necessary addition to vehicles in the same way as airbags or radios were. However, the growing need for a more accurate navigation system, especially for truck and HGV fleets, paved the way for further development of Sat Navs. What Are Truck Sat Navs? In the past, those who drive for a living had to rely on old-fashioned maps to navigate their way. Their usual arsenal would include a flurry of country maps and city maps specific to their destinations. The usual process for a long journey includes poring over maps for hours, plotting their route, and constantly checking maps along the way. They would also need to regularly purchase updated maps, especially if an area is being developed. Technology then evolved to downloading mapping software on one’s computer, where a driver could print any given location’s map. However, if the driver went to a different route, they would have to go back to a computer and print another set of maps. The advent of GPS technology also gave birth to the first Satellite Navigation or Sat Navs available to the market. With it, you can pinpoint exactly where you are on the planet. The technology also allows any driver to work out the best route they could follow. Devices that can use GPS software were introduced to consumers and businesses, allowing for a more convenient way of navigating. Sat Navs detect signals from at least three satellites circling the globe. When your device receives light-speed data from these satellites, it then locks down your precise location using a mathematical formula called trilateration. With trilateration, your device can also calculate your speed and the direction you are heading. In the last few years, Sat Navs were developed into a smart machine that could give drivers turn-by-turn directions, traffic alerts, Bluetooth connection to smartphones, as well as locations of surrounding establishments. Thanks to these additional features, Sat Navs have also evolved into fleet management devices. How Do Truck Sat Navs Differ From Consumer Sat Navs? Smartphones made Sat Navs available even to the average consumer. Although these apps are powerful and convenient, trucks and HGVs have different needs than regular small cars. This is where professional truck Sat Navs come in. You can input your truck’s specifications. This is the main difference between smartphones and truck Sat Navs. You will be able to input your vehicle type, dimensions (weight, length, width, height), as well as max speed and presence of hazardous materials—details that the built-in map would take into consideration when choosing a route for you. It takes vehicle restrictions into account. With your truck’s dimensions programmed into the device, your Sat Nav will avoid routes that are not good for your vehicle. For example, low bridges or areas not suitable for hazardous materials. It details points of interest. Every point of interest (POI) is marked on the map, in case you need to find one along the way. Bus stops, truck stops, gas stations and the like would be visible for the driver’s convenience. No separate expense to connect to the internet. Smartphone owners are often billed separately for internet use, and it could become costly for long drives. Sat Navs can work offline, as it uses satellite technology to give you the information you need. Truck Sat Navs that have the feature to connect to the internet will either have WiFi capabilities or built-in SIM cards. It provides the right screen size for drivers. Not all smartphones come with huge screens. Most of the time, you will have to zoom in to see the map’s twists and turns—a potentially dangerous thing to do while driving. With truck Sat Navs, you will not have to manually zoom in, as the screen is big enough for you to see where to go. Truck Sat Navs are specially designed to keep a driver away from road mishaps, such as getting wedged in narrow roads or hitting low bridges. It also saves other road users and pedestrians from traffic disruptions and accidents. What Are The Benefits Of Truck Sat Navs? It is always ideal for professional drivers to find the most efficient route towards their destination. Delays in delivering products can cost your company a hefty financial setback, as well as affect its reputation. Avoiding traffic. Thanks to its access to real-time information, you will be alerted if the route you are on would lead to any traffic, blockade, or accident. You will then be diverted to an alternate route. Convenience. Knowing where the POIs are on your Sat Nav can save you time, instead of driving around looking for a gas station or the closest restaurant for a quick snack. Save on fuel. With accurate data constantly fed on your device, you will know the fastest way to reach your destination without unnecessary detours, effectively reducing fuel wastage. Know when to slow down. Is there a police car on standby nearby? How about a speed camera or a police speed gun? Sat Navs can alert you if any of these are along the way, warning you to check your speed and possibly avoid costly speed tickets. Safety. How many times have you heard of drivers using their smartphones only to be sent to the wrong (and possibly questionable) town? Sat Nav systems are more reliable than mobile phone masts and base stations, as it’s always updated—guaranteeing you not just the shortest but also the safest route to your destination. Data collection. For fleet managers, making sure that trucks are in top shape is of prime importance. Sat Navs can help you pinpoint where to look by collecting data on throttle position, fuel use, and engine diagnostics. If a driver tends to over brake or over rev, you can educate them and help save the company fuel and costs. Sat Navs are not the easiest device to purchase, as you need to consider the type of unit that best fits your business and driver’s needs. The TomTom PRO 5250 Truck is perfect for leased vehicles, subcontractors, and temporary vehicles/workers due to the flexibility it provides. Technical specifications – 5” (13 cm) touchscreen, up to 2 hours battery life, 16GB internal memory with microSD slot, 480 x 272 pixels, 229 grams of weight. There is no Bluetooth connectivity. Portability – not a fixed device, which then allows it to be moved inside the vehicle wherever convenient. It can also be exchanged between one vehicle and another. The TomTom PRO 8275 Truck is also a navigation and fleet management device, but it provides a new set of features that would customise it to fit your business’ needs. Technical specifications – 7” (17.7 cm) touchscreen, up to 3 hours battery life, 16GB internal memory with microSD slot, 1024 x 600 pixels, and 480 grams of weight. It also has a 3.5 mm jack video line-in, with 5 MP rear camera with flash for barcodes and documents, as well as near-field communication and 3G modem. Whichever Sat Nav you pick, make sure that you have taken into account the features and specifications of each, and that they fit your business needs. When partnered with WEBFLEET technology, operators will be able to manage their vehicles better by knowing the real-time position of each truck, alerting you of any change in routes. It also provides comprehensive reports of each trip. For more information on our range of truck Sat Navs, give us a call at 0333 2000 670.